People doing paid and unpaid work contribute to economic growth and Niagara’s overall living standard. The capacity of individuals and their families to participate in the economy and community is related to access to quality jobs, workers’ ability to make a living wage, and how readily employers are able to find employees with skills that match jobs being offered. The 2016 Canadian Index of Wellbeing (CIW) National Report tracked Indicators from 1994 to 2014, including time spent on work-related activities. Compared to 20 years ago, on average, Canadian workers are spending more time commuting; working fewer hours per week; and are more likely to have flexible work hours. Over 30% of Canadian workers in the lowest income households do not have regular, daytime Monday to Friday work hours. This affects daily routines, access to services, and time for family, community and adequate sleep. Since 2008, more Canadians – especially women – are working part-time due to lack of availability of more secure, full-time employment. Significantly more people (13.1%) are working less than 30 hours a week – not by choice. Prior to 2008, this number had been falling steadily. Since 2014, the size of Niagara’s labour force has increased by 4.3%, and unemployment rates fell to 7.1% in 2016, well below the recession period peak of 10.4% in 2009. Numbers of people in Niagara on Ontario Works (OW) support are showing early signs of stabilizing compared to post-recession levels, with a 2016 year-end OW caseload average of 10,826. National methodologies are now being applied to calculate Niagara Living Wage and Cost of Living levels. In 2017 the Living Wage is $17.56/hour, and the conservatively-estimated Cost of Living for a family of four with two children is $71,294, according to Niagara Poverty Reduction Network reports. There is a focus on building future workforce capacity by engaging secondary and post-secondary students in experiential education opportunities. Between 2008 and 2016, over $4.8 million, or just over 40% of Niagara Prosperity Initiative (NPI) funds, invested by Niagara Region in neighbourhood-based projects, supported child/youth education programs, back-to-school programs, and development of job-specific skills. Research is underway to describe precarious employment in Niagara, modelled after a study by McMaster University and United Way (UW) Toronto & York Region. UW of Niagara Falls and Greater Fort Erie and the Social Justice Research Institute at Brock University are leading this research, with funding support from the Ontario Trillium Foundation. Niagara Region Social Assistance and Employment Opportunities, and the 8 Employment Ontario Agencies in Niagara are leveraging opportunities to integrate service planning across the employment system. This improves coordination and better aligns, and, where appropriate integrates service responses for both job seekers and employers. The Niagara Job Development Committee includes 20 community-based agencies working together. They promote a common approach to assisting Niagara’s employers with hiring, by providing well-prepared job seekers and training supports and services. This committee is increasing employment opportunities, enhancing capacity for service delivery and coordination, and strengthening responsiveness to employers’ needs. The #Rethink Niagara initiative is engaging people, organizations and businesses in sharing data and planning, to reduce or remove barriers so that people can participate in the economy and build up their own ability to be financially secure. When people experience financial security, they are freed up to be customers, employees, employers or business owners, and to engage in the community. Support collaborative data-sharing and planning to help strengthen quality of jobs and reduce employment precarity in Niagara. Advance work being done to build a map of Niagara that describes adult literacy rates in the context of modern-day workplace competencies. Encourage students and jobseekers to see entrepreneurship as a viable career path or as a shorter-term option that may lead to full-time employment. 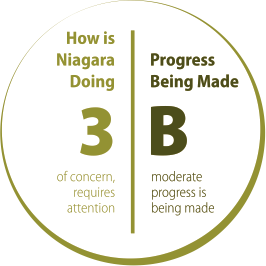 Build upon work already done to describe the relationship between workplace mental wellness and productivity in the Niagara context. Pay attention to changes made through the Ontario Poverty Reduction Strategy, to ensure community members are informed so that they are able to leverage increased funding for OSAP, child care, the energy support program and health benefits for youth up to age 24.